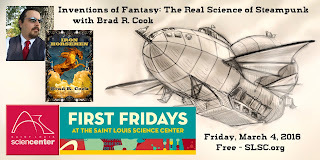 This Friday, March 4, 2016 I will be presenting Inventions of Fantasy: The Real Science of Steampunk at the St. Louis Science Center’s First Fridays event. It’s part of the SLSC’s Steampunk Science night, and there are numerous steampunk themed events to enjoy. I’ll also be introducing the movie, The League of Extraordinary Gentlemen, later that night! It’s going to be a fun night at the St. Louis Science Center. I invite you all to join us, and best of all most of the events are free! My talk begins at 8pm in the Omnimax Theater, I’ll be signing books at 9pm, and the movie begins at 10pm. Steampunk twists technology in interesting and unusual ways, but the Victorian Age was filled with inventions that the modern world finds commonplace. Explore what was possible with steam, the early days of electricity and the inventions that emerged from the industrial revolution. Brad R. Cook, is the author of the steampunk novels, Iron Horsemen and Iron Zulu. Later this year he will complete the trilogy with Iron Lotus. Free tickets for this presentation are available at the Main Lobby and Planetarium box offices beginning at 6pm. The presentation will begin at 8pm in the OMNIMAX® followed by a book signing with Brad in the OMNIMAX® lobby after the presentation. Be sure to check out the St. Louis Science Center every month for their First Fridays events. Next month on April 1st they have It’s All Fun and Games!